Driving about 90 kilometers northeast of Armenia's vibrant capital city of Yerevan, the highway narrows into mountainous roads as you enter the Tavush region famous for its resort town of Dilijan. Driving about 90 kilometers northeast of Armenia's vibrant capital city of Yerevan, the highway narrows into mountainous roads as you enter the Tavush region famous for its resort town of Dilijan. The unseasonably hot and humid summer has vacationers flocking to "Armenia's Switzerland" from across Armenia and bordering Georgia, Russia and Iran, as well as from various parts of Europe. They come seeking what affluent folks of Transcaucasia sought when they built their summer villas here -- the crisp, alpine mountain air of unspoiled forests, preserved national park and lakes and to bask in the natural healing springs. In fact, Dilijan mineral water is bottled and marketed throughout the country. Dilijan's winding mountainous roads are dotted with roadside vendors selling locally picked mushrooms in large bowls and corn on the cob, known here with its Russian word googooroz. As the heavy mist on the road settles in even thicker, we stop at a makeshift roadside grill where a woman vendor opens the top of a steaming pot and asks us to select the cobs we want for about $1.50 each. She drops the selections on a plastic tray, rubs them with a stick of butter, sprinkles salt and drops them into individual plastic bags before handing them to us. The warm, juicy sweet corn really hits the spot after an exhausting trek of nearly an hour and a half drive through winding narrow roads. The town of Dilijan is terraced in levels and hugged by natural beauty of its surrounding forests and mountains - the rushing waters of the Aghstev River winds through the lower level of the town. No need to go mountain climbing here - Dilijan's streets are steep hills of endless labyrinths that only rise higher and are dotted with once quaint, now rundown houses with patched, tiled roofs accented with balconies with wood-carved railings - Dilijan's signature architectural design introduced in the 19th century by Molokans, sectarians who settled in Dilijan from Russia. At the town center rotary I pop into a few hole-in-the-wall cafés that offer limited selections. Behind the rotary an expansive shallow man-made lake stands empty and its surrounding park is overgrown with moss. Some of the Armenian tourists pose for photographs before a three-man statue paying tribute to an epic movie "Mimino". Across the street stands the white, five-edged monument built on the 50th anniversary of the Soviet rule. The town's 12,000 population has dropped from its 24,000 in late 1980's. Lessening tourist rates has given way to rampant unemployment and increased emigration -- and that's evident from numerous empty storefronts and homes for sale. Across the town square, at one Getabnya Street, I find the 1896-built Dilijan Folk Art Museum - a two-story traditional Dilijan residence of princess Mariam Tumanyan. Rooms full of antique rugs, regal jewelry and period furniture offer the visiting tourists a view of Dilijan's past glory. Away from the center, walking up Myasnikyan Street, an imposing building houses the newly renovated Geological Museum and Art Gallery -- a two-story, marble floor museum exhibiting a collection of early works by Armenian and Russian artists and excavated artifacts from the region. 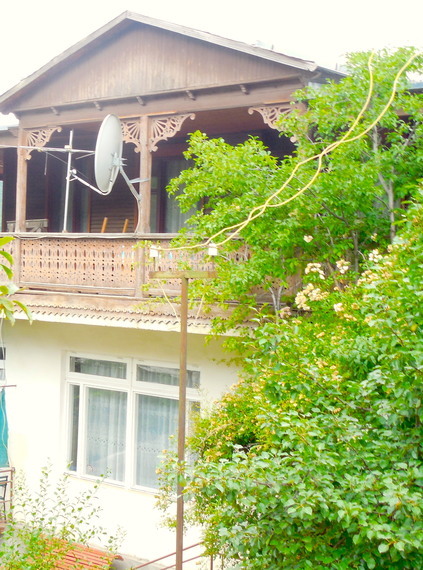 Further down, on Sharambeyan Street, sits the Tufenkian Foundation's "Old Dilijan" compound. It captures and brings to life the bygone elegance of Dilijan with newly built homes and store fronts true to the town's authentic signature architectural designs of wood-carved railing balconies with windows sporting elegant wrought iron railings created by local Dilijan artisans. The compound includes a hotel, restaurant, museum and a number of artisanal storefronts where you meet craftsmen creating and selling their handicrafts. The compound's Haykanoush Restaurant offers delicious Armenian fusion cuisine in a carpet and wood decorated setting. At sundown the restaurant's adjoining deck has just the right breeze for our after-dinner Armenian coffee with apple pie dessert - not to mention perfect views of the surrounding mountains. Another unique dining experience, is the newly opened Dolmama's Flying Ostrich Bar & Grill Tavern set along the Aghstev River shores with an expansive, mossy, cobble stone yard centered with an outdoor grill and bar hugged with outdoor dining seating. The adjoining two-story renovated barn, dotted with eclectic artworks, offers cozy indoor dining, great jazz melodies and meticulous, decorative accents. The restaurant's signature bread is delicious - so is its outdoor grilled pork chops and pizza. And definitely try their Armenian sweet bread "gata" for dessert. If you're looking for a more casual dining experience with younger crowd, drop by the newly opened, one-room Rudder Pub in the town's center, tucked by the commuter bus station. It offers a lively hangout for food, drinks and live performances - a direly needed spot for the town's youth who have very few options. Although today's Dilijan is desolate and worn-out, newly opened B&Bs, restaurants, boutique hotels and even large hotel chains like Best Western dot the landscape in preparation for what many hope will be the town's upcoming internationalization boom, promising to inject a much-needed vivacity into Dilijan. Among those descending upon the resort town are entrepreneurs and philanthropists with grand economic redevelopment plans for resuscitating Dilijan into an educational, cultural, recreational and financial hub for the entire region. Traces of the emerging boom is already evident in the striking glass and white concrete building of the Central Bank of Armenia's training and research center perched on top of a hill overlooking the town. This summer the training center hosted its second group of interns from Harvard University. Along the town's main street, overshadowing the police station and few local grocery shops, sits the Bank's newly renovated four-story Knowledge for Development Center - a collaborative project with the American University of Armenia (AUA) - which houses the bank's museum, a much needed state-of-the-art public library, AUA's Extension program offering courses in tourism and hospitality management, and the Dilijan branch of Yerevan-based Tumo Center for Creative Technologies after school program that offers a myriad of workshops for the local youth. But more importantly, massive cultural and economic redevelopment plans are underway and spearheaded by Initiatives for Development of Armenia (IDeA) Charitable Foundation and Dilijan Development Foundation established by philanthropists Ruben Vardanyan and Veronika Zonabend. A visit to the group's supported new college of the United World Colleges network UWC Dilijan College is a must. The "green" building sports rooftop and vertical garden exterior with state-of-the art facilities for the lucky few admitted to the program from around the world. UWC Dilijan opened in 2014 with 96 students enrolled from 48 countries in its first academic year. Ninety-six students will enter the college this academic year expanding the number of countries represented to 63. The UWC mission is fully aligned with Dilijan's future redevelopment plans - enabling co-existence of students from diverse backgrounds, required participation in transformational community service projects that lead to cultural understanding, peace and a sustainable future. Veronika Zonabend, co-founder of the IDeA Foundation and the UWC Dilijan explains: "We aspire to turn Dilijan into an educational hub, to make it attractive by creating different educational platforms - through art, science, international interaction, etc. We want people from all over the world to come Dilijan to invigorate their mind and body, search for new ideas and get inspired." The town folk eagerly talk about and await the upcoming redevelopment plans and the long-term economic revitalization strategy, which they hope will once again revive Dilijan to its bygone days as "Armenia's Switzerland". The future plans include: rebuilding of the lake and its adjacent park, reinstating Dilijan's reputation as a high-end resort town by building a world-class spa/hotel, stimulating city's community spirit for the youth and the women through the creation of a Youth Center and a Women's Resource Center - all while remaining true to zoning ordinances which was introduced to the local municipality to ensure compliance with urban development standards. During a late night conversation at Dilijan's Toon Armeni B&B, with Kira Yankelevich who manages the volunteer programs for RVVZ Foundation, she underscores the importance of collaborative efforts between UWC Dilijan College, IDeA Foundation and other NGOs as Birthright Armenia, Tumo Dilijan, Bridge of Hope among others to help introduce outside perspective and create mutual learning for local Dilijan residents. Since community services is the integral part of the International Baccalaureate program, UWC Dilijan College students team up with local organizations to empower residents to take an active role in the design and implementation of their own enriching community projects. An example of collaboration between the UWC Dilijan summer camp of 2014 participants, community members and Tumo students (ages 16-18) is the poignant, nine-minute documentary Kinoteatron which offers stirring interviews with town elders recalling fond memories of the once thriving town boasting three movie houses, performing arts centers and other cultural events including lectures and presentations by cultural icons which enriched and sustained the greater community spirit and how the absence of the institutions has deprived the town of its historic cultural and intellectual vibrancy. Plans are already underway for UWC Dilijan, in partnership with an international organization specializing in educational programs, to launch a summer camp offering in 2016 open to youth from all over the world. The camp will offer workshops and programs on various topics including science, theater, filmmaking and more. "We know that cinemas brought the Dilijan community together, allowing neighbors, families and friends to interact, share ideas and thoughts and preserve a sense of community," says Yankelevich. "There's no such place in Dilijan today where the community can gather to socialize and enjoy various entertainment venues. So it's important to rebuilt that culture and make Dilijan the vibrant community it once was." With foresight, vision and deep conviction of such individuals, organizations and philanthropists perhaps today's Dilijan will regain its reputation and surpass expectations. It is most certainly worth the wait! !